New Accompaniment Album Releases March 30th. Featuring 10 New Songs Featured From Matthew Parker, We Are Leo, Landry Cantrell, Joel Vaughn, The Rock Music, Abigail Duhon, New Hope Oahu, Mass Anthem, and Long Hollow Wave. Pure Flix Presents GOD'S NOT DEAD: A LIGHT IN DARKNESS, opening in theaters nationwide Friday, March 30th. Featuring a star-studded cast, including David A.R. White, John Corbett, Ted McGinley, Shane Harper, Jennifer Taylor, Benjamin Onyango, with special appearances by Dr. Cissy Houston and Tatum O'Neal. 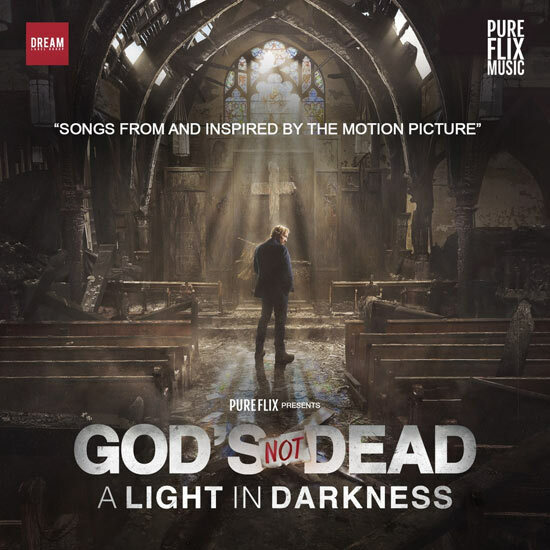 Los Angeles, CA (February, 2018) -- DREAM Label Group and Pure Flix Music, will release God's Not Dead: A Light In Darkness - Songs From And Inspired By the Motion Picture as a digital album on Friday, March 30th with a special CD touring edition available sold at the artist events. The digital pre-order will begin on March 16th and two singles, "Miracles" by Matthew Parker and "Rebound" by Abigail Duhon will be available as Spotify exclusives on February 23rd. The album is in connection to the nationwide release of the the film GOD’S NOT DEAD: A LIGHT IN DARKNESS—featuring a star-studded cast, including David A.R. White, John Corbett, Ted McGinley, Shane Harper, Jennifer Taylor, Benjamin Onyango, with special appearances by Dr. Cissy Houston and Tatum O’Neal. Coming to theaters nationwide March 30, 2018, GOD’S NOT DEAD: A LIGHT IN DARKNESS is a powerful reminder that in all circumstances, we are called to be a light for Jesus to a world in desperate need of hope.